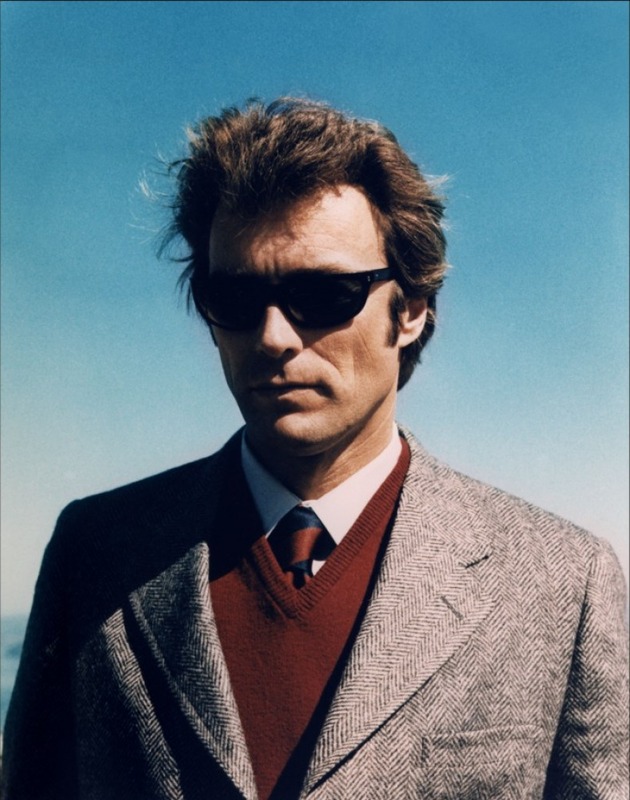 Clint Eastwood as Inspector “Dirty Harry” Callahan in The Enforcer (1976), the third film of the Dirty Harry series. After receiving the news that his friend, Inspector Frank DiGiorgio (played by Robert Mitchum’s brother John Mitchum), has been mortally wounded in a gunfight with Patty Hearst-like thugs, Harry immediately heads to the hospital like any good friend would. 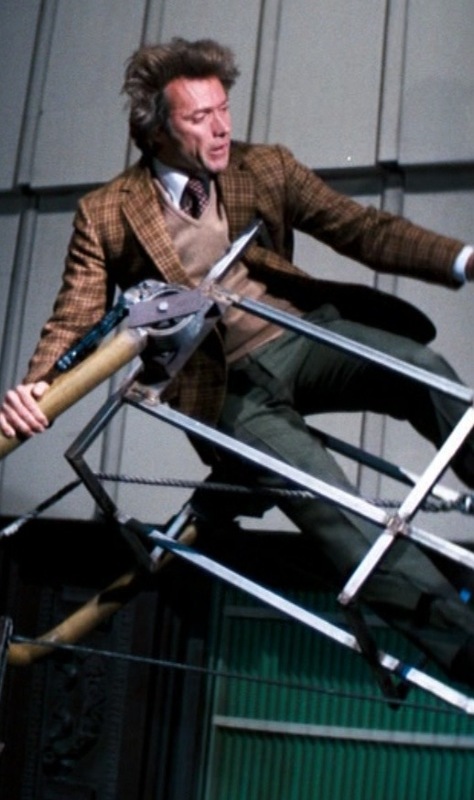 Clint Eastwood in the climactic scene of Dirty Harry (1971). After stuffing our faces and stomachs during the Thanksgiving holiday this weekend, it’s certainly appropriate that you’d want to return to work feeling like a badass. That’s what Clint Eastwood is here for. 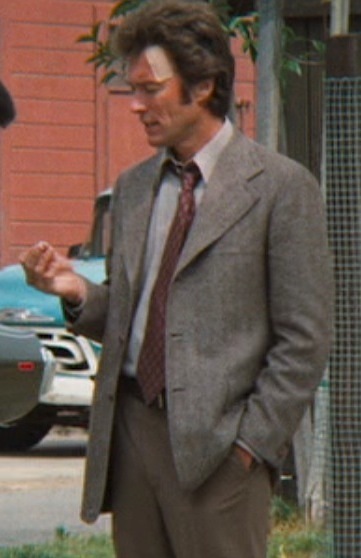 Having established his central look earlier in the film as a sport coat and slacks (gray herringbone and brown plaid), Dirty Harry throws a lateral for the final confrontation against the brutal “Scorpio Killer” by wearing a sharp, slim cut brown three-piece suit. 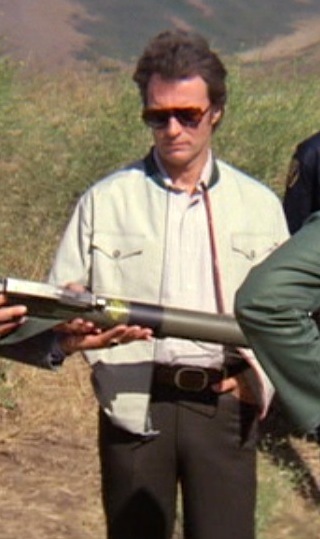 Clint Eastwood as Insp. 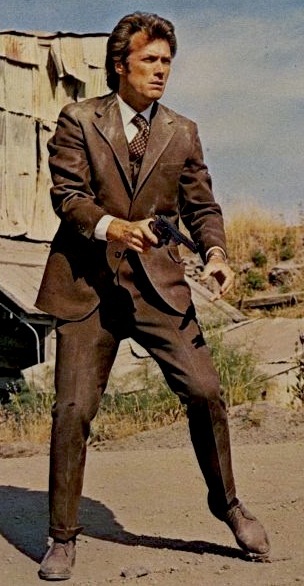 “Dirty Harry” Callahan in Dirty Harry (1971). As mentioned in the previous Dirty Harry post, many travelers are fooled into thinking that San Francisco’s climate is reflective of California as immortalized by the Beach Boys. Instead, the city enjoys cooler Mediterranean-style weather with dry summers and mild winters. Travelers unaware of the fact that they’ll be enjoying a summer with evenings that can dip into the 40s (Fahrenheit) are easily spotted by their brightly-colored hoodies emblazened with the name “SAN FRANCISCO” on the front, newly purchased from an enterprising street vendor rightly taking advantage of ill-informed tourists.